Some of the ways plumbing technology has evolved and reasons you might want to own a Smart faucet. This simple process can add years of life to a water heater. Almost a quarter of a million people a year have an accident in the bathroom which takes the a day or more to recover. Keeping your plumbing running efficiently can prevent flooding in the home. A dishwasher has several critical functions in the kitchen. It would be an injustice to say it merely cleans the dishes. Because a dishwasher is one of the primary electrical and plumbing tools of the household, we’re going to review how to clean it and keep it functioning properly. Fortunately, the number of dishes which fit in a typical dishwasher are more than a couple of meals’ worth. So, the first job of a dishwasher is to hide those dirty dishes out of sight, and keep the bug population away and odors at bay. Once the load is set in motion, not only does a dishwasher clean the dishes, it also disinfects them. This disinfection comes as a result of the dishwasher’s heat function, which climbs to 140 degrees F. The heat disinfection is the primary reason that washing dishes in a dishwasher is so much more effective than hand washing them. The electricity this heating water uses is offset in terms of health benefits, as it will keep your family from spreading germs through dishes. For plastic items and those deemed to delicate for the dishwasher, consider soaking them in 2 teaspoons of bleach per gallon of water. Soak clean dishes for two minutes, rinse and dry. The dishwasher has now become a storage for clean dishes. It’s also become fodder for a great number of arguments between children and parents. A dishwasher should be cleaned monthly. If the family is a pack of foodies who cook and eat at home regularly, cleaning may have to be done more often. 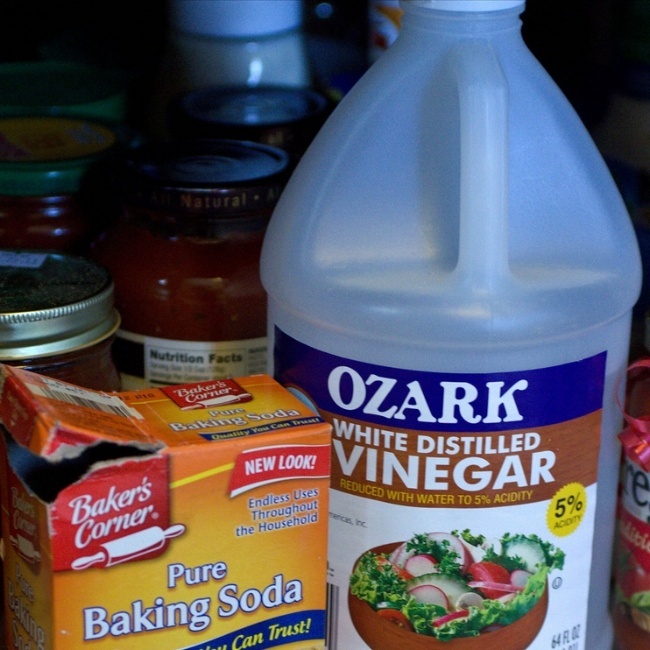 The basic components are vinegar, baking soda, a sponge or dishrag, and a microfiber towel. First, remove all the wildcat dishes which have been living in the dishwasher for several cycles. This includes spoons, lids, and other items which have either stuck in one of the utensil baskets or fallen into the bottom of the dishwasher. Remove the bottom rack from the dishwasher and give it a good wipe down with some hot, sudsy water and the dishrag. Then, use the rag to clean out the obvious bits of food and gunk from the bottom of the dishwasher, itself. If your dishwasher has a filter, you may periodically (not every cleaning) wish to remove that and clean it according to the user’s manual. If you don’t have the manual, Google the make and model and find one online. My manual says if your dishes feel gritty after a wash, or if you can see the filter is dirty, it’s time to clean it. Don’t forget to return it and secure it again before proceeding. Return the bottom rack to its place, and then pour a cup or two of the vinegar into a dishwasher-safe cup or bowl and place it upright in the top rack. Run the dishwasher on the hottest setting, but forgo the drying cycle. Have a look inside after this step. If you still aren’t satisfied with the results, you may wish to repeat the cleaning process, only this time, sprinkle baking soda around the bottom and sides of the dishwasher. You can even get a little on the racks and inside the door--it won’t hurt it. Then add another cup of vinegar in the same manner as previously described and put it on the short wash cycle. Remember, again, you don’t have to dry the inside of your dishwasher, so the drying cycle isn’t necessary. Last, use the dishrag and hot, soapy water to clean the outside of the door. Don’t forget the sides! Afterward, wipe it down with a soft towel. If the door is in sad shape, you may want to decorate it with faux metal, like this woman. If you need a licensed, bonded, insured plumber for your Phoenix area leak or your next plumbing project, call MNS Plumbing today at 602-362-4524.